Agatha Christie was born in southwest England to a wealthy upper-class family. Christie was schooled at home and was an avid reader from a young age enjoying books by Edith Nesbit and Lewis Carroll and, later, mystery novels by Wilkie Collins and Sir Arthur Conan Doyle. 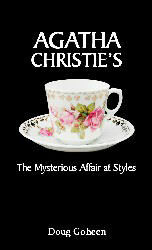 The Mysterious Affair at Styles (1920) was Christie’s first published novel and features the famous Belgian detective Hercule Poirot, who became one of Christie’s most famous characters and appeared in 33 of her novels and 54 short stories. Two other recurring characters are introduced in the novel for the first time as well: Chief Inspector Japp and Arthur Hastings. In The Mysterious Affair at Styles, Poirot appears as a former Belgian police officer who is a refugee in Britain after Germany’s invasion of Belgium. His character is thought to be inspired by the Belgian refugees Christie encountered in Torquay. Known for his magnificent mustache and astute attention to detail, Poirot was always popular with readers. Despite this, Christie wrote in her diary that she found Poirot to be an “insufferable” character and an “egocentric creep” and preferred the character of Miss Marple. When Christie killed off Poirot in her 1975 novel Curtain, Poirot was given an obituary in “The New York Times.” The author of 66 detective novels and 15 short story collections, Christie is best known for her bestselling novel And Then There Were None and her play The Mousetrap.